The Next George Bush Bet Everything on Trump In a time of outsider politics, can the ultimate insider resurrect his familys brand? Perhaps Bushs seesaw approach to the president will be enough to secure his next office. Or perhaps Trumps Texas base will continue to grow more fervent, at the same time that Democrats continue to mobilize millions of voters. In that case, Bushs future may be determined not by his ability to bridge the political chasm, but by his willingness to pick a side. Bet everything on Trump? George P didn’t seem that into Trump according to the last 3 paragraphs. There is no way any of the bush clan support Trump in any way. Really not much more complicated than that. Message to ALL Bushes: GO AWAY!!!!!!!!!!! PLEASE, Texas, DO NOT elect George P. Bush to anything else. George P. Bush is likely the reason the GOP went along with the Kenyanesian Usurpation. He is as ineligible as the Kenyan from Indonesia. He was born a Mexican national because of his Mexican national mother making him ineligible to be President. 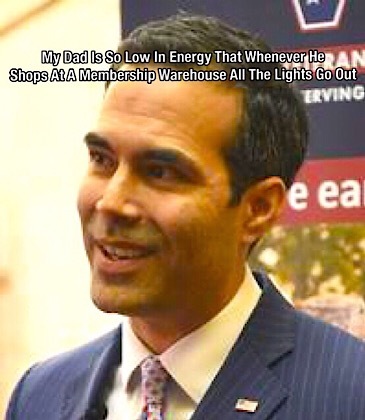 George P. Bush is trying to fake like he supports Trump only to insure his electoral survivability. The most important thing to ALL Bush League Republicans is completing the GHW Bush Plan for North Mexico (aka USA) with amnesty for those already here. Bush had a mandate and money to build a wall and did nothing because he wanted amnesty. Shut up George. W, you dissapoint me long-time. No more Bushes. No more Clintons. Ever. President Bush.... either go all in in support for President Trump or just shut the hell up and stay in Waco. Now his not the time for wishy-washiness. The latest George P. Bush news from a couple days ago is that he is demanding the removal of all Confederate monuments and statues in the state of Texas. G. P. Bush is vicious venomous snake being groomed for bigger things by his globalist clan. This is a hit piece from many years ago regarding an incident GPB had with his girlfriend and her family. I don't know how it would affect his political aspirations going forward. I'm surprised it hasn't dogged him during his political career. So George P. Bush--son of Jeb and the political dynastys fourth generation standout--is making his Washington, D.C. debut this week. The 37-year-old lawyer is now running for Texas land commissioner, but his family reportedly expects bigger things from the telegenic offspring of the former Florida governor. Which is as good an excuse as any to revisit a police report detailing George P.s creepy, stalkerish behavior towards a former girlfriend. A Miami-Dade Police Department report includes an account of the December 31, 1994 incident provided to cops by Murry Cohen, Cristinas father. According to Cohen, Bush--wearing black shorts and no shirt--arrived at the residence and went to his daughters bedroom window, pulled it open, and pushed the screen inward. As Bush was climbing in the window, Murry Cohen awoke and spotted the trespasser. A neighbor of the Cohens also spotted Bush trying to get into the residence and began to argue with him. With his intrusion thwarted, Bush backed out of the window. Cohen reported seeing Bush then jump into a vehicle and flee. But he would not be gone for long. Bush returned to the home 20 minutes later and drove his car through the Cohenss yard, causing damage to about 80 feet of the lawn. After the Cohens provided police with Bushs home address, an officer went to the residence and spoke to him and parents. But since Murry Cohen did not want to press charges, Bush was not arrested on the scene, according to the police report. When police checked back with Cohen several days later, he told a detective that he was not interested in pursuing charges against Bush, and that he wanted the matter resolved. Cohen then signed a non-prosecution form. A month before his son attempted the illegal bedroom incursion, Jeb Bush lost the Florida governors race to incumbent Democrat Lawton Chiles (Bush won the governorship four years later, in 1998). a successful businessman, philanthropist, civic leader and veteran dedicated to advancing conservative values. The married Fort Worth resident and his wife are expecting their first child this summer. If the f’in Bushes keep this up, they are going to drift into Tlaib/Omar country. To the Bushes: Just shut up already. Nobody in either party wants to hear your silliness now. No more Bushes! No more Clintons! No more Kennedys!